What's better than digital files languishing on your computer? even nicer than a wallet of prints? When it comes to displaying your pictures, bigger is definitely much better. 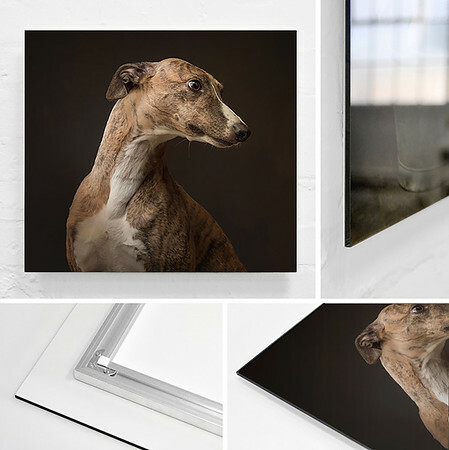 Large scale canvases and display mounts are a fabulous way to show off your favourite images from your madaboutgreys photoshoot, and make a real statement on your walls. Here are just some of the options that I offer. 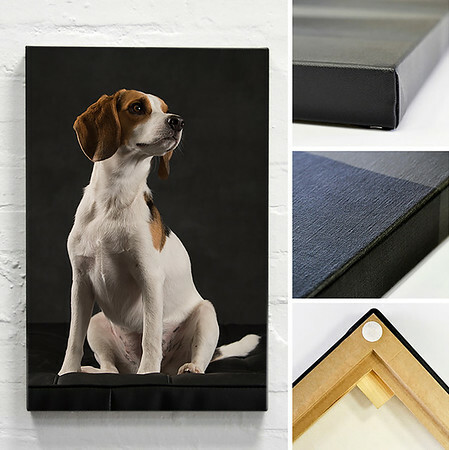 Perfect for showing off your favourite images, a professional quality canvas looks fabulous as the centrepiece on any wall. These canvases are printed on the latest 12 Colour machines and using only the best Fine Art materials. All canvases are coated with museum grade uv varnish mix and stretched by hand by skilled craftsmen. They are supplied ready-to-hang and built to last. Prices start at £160 for 16x12"
Wall display with the ultimate wow factor. High gloss acrylic mounted prints are perfect for showing off your images in a modern setting. Using the same technique employed by museums and leading galleries, your image is sealed under acrylic glass, to give it remarkable depth and the best colour rendition. Bonded using the finest UK made fine art adhesive your images are fully UV protected & sealed to last a lifetime. Sizes start from 10x8" at £120, and £170 for 16x12". Very large wall art pieces work especially well in this format and I offer acrylics in sizes up to 60x40". My HD Acrylic is inset into a custom-made wooden tray frame with an 8mm surround. The edges of the acrylic are completely visible, giving the illusion that it is suspended within the frame. This is an ideal product for those wanting the clarity and brilliance of an HD Acrylic but needing the artwork to sit within a framed environment. Wooden tray frames are available in black or white. 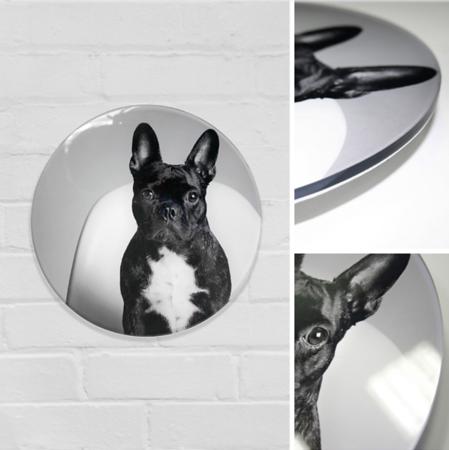 Prices from £260 for 16x12"
The ever popular HD acrylic in a contemporary circular format. This style works particularly well with formal studio portraits and adds the wow factor to your walls. Standard sizes are 20, 30 and 40 inch diameter. Other custom sizes also available. Prices start at £260 for a 20" diameter orb". Can't choose a favourite image? Want lots of them on display? A Portfolio Box could be the answer. A boxed collection of your favourite pictures, printed on Fuji Silk Or Mohawk Eggshell fine art paper and mounted on rigid board backing. 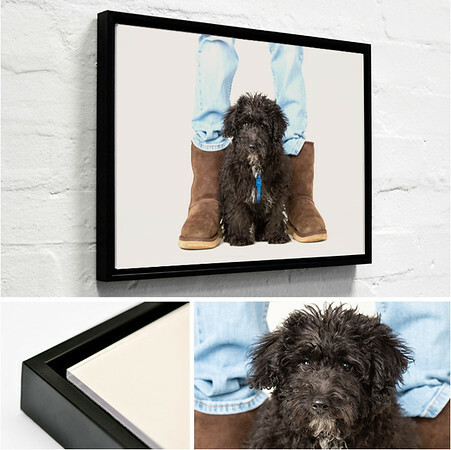 The prints come in a very smart presentation box, custom-made for you, finished in textile or leatherette (a huge range of colours is available) and personalised with the name of your pet. Prices start from £200 for a box with five mounted prints in 30x20cm (roughly A4) size. Other sizes and extra prints also available. 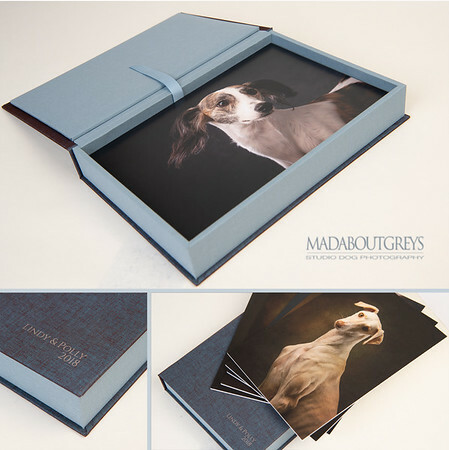 A hard cover photo book designed round your favourite pictures from your shoot. Just choose the images and leave the rest to me. Hard cover, printed on premium lustre paper. 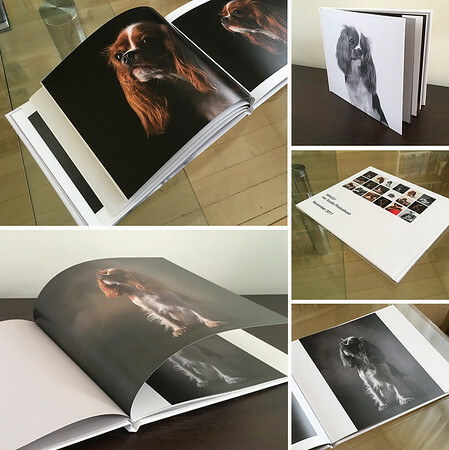 Prices start from £160 for a 25 x 21cm book with 20 pages and at least 20 pictures.